Even the most disciplined exercise habits can be knocked off course by bad weather, but with a treadmill, this inconvenience can be completely removed. The first “treadmill” was known as the “tread wheel” in 1st century AD Rome, and after thousands of years of technological evolution, millions of people have used the machine as a tool for enhancing their cardiovascular health and abdominal muscles. The following manual treadmills are among the best-reviewed manual treadmills on the market that you can choose to make your workout regimen more convenient. The Confidence Fitness magnetic manual treadmill was designed to operate smoothly and silently. The treadmill can run with eight different levels of magnetic resistance that the user can directly adjust to their specifications. For a greater challenge, the owner may choose to create a slightly higher incline on the deck to increase resistance. The customizability of the treadmill is taken farther with the adjustments made possible by a multi-function computer. With the computer, users can accurately coordinate their speed with the distance of the run that they would like to complete by the end of the session. In addition to directly coordinating the speed and the distance, users may also choose to track their overall calorie output as they continue to run. The treadmill’s display is complete with an odometer and a timer. To assist in the convenience of transporting the treadmill, the machine has been designed with built-in wheels and a locking pin. The sturdiness of the treadmill allows it to safely handle the weight of people up to 220 pounds. Some reviewers reported that they had leveled off the treadmill’s inclined by placing wooden blocks beneath the treadmill’s back legs. Leveling off the treadmills incline might potentially be a wise choice for any owners who frequently experience pain in their knees. Prospective customers should be advised that their running distance on the treadmill can only be measured in kilometers, not miles. Reviewers have claimed that one of the treadmill’s positive points was the lack of breakable parts that are common in the more expensive treadmill models on the market. The treadmill’s manual comes with a troubleshooting page that contains instructions on how to fix the belt if it becomes compromised in any way. Overall, the treadmill allows users to have a well-supported run. One reviewer testified that they personally didn’t choose to run on it due their relatively low running speed, but even while only running, they still found that they were able to have an effective 30-minute workout just with its regular incline and resistance. The reviewer stated that the treadmill came mostly assembled on the day that it arrived, and it only took a few brief minutes of hands-on work before it was completely ready for use. The reviewer found the size of the treadmill to be satisfactory, and yet still small enough to be placed in their room without taking up too much vital space. The treadmill was light enough for the reviewer to carry up their stairs without any difficultly, and when on the ground, it was easy for them to move. Another customer who left a positive testimony began their report by stating that they did run into some initial complications with the belt. After contacting the manufacturer, the owner was sent an instructional YouTube video to address their belt problem. While the first half of the video didn’t entirely concern them, as the treadmill has no motor, the second half gave them vital advice; when you are adjusting this treadmill’s belt, it’s a wise move to do a brief “test walk” in order to gauge how much progress you’re making on the repairs. The user was able to get their treadmill belt into perfectly operational status quickly, and after that, running and walking on it was no trouble at all. The owner stated that due to the incline, they did have to make a point to hand on to its handle in order to maintain its balance. 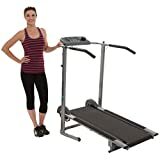 The user testified that they were able to get a better workout on this manual treadmill than they had been able to get on an electric treadmill in the past. The Confidence Fitness magnetic manual treadmill’s footprint is 19.1 x 47.2 inches. The tread size width is 14 inches and length is 39 inches. The treadmill is not inherently designed to accommodate a highly wide stride, but users who are 5’10” or below are likely to find that the tread size is a good fit for their stride. The treadmill’s dimensions are 48 x 24.4 x 9.3 inches when folded, and it weighs approximately 46.9 pounds overall. The standard list price is $299.99, but during promotional sale periods, the treadmill can be purchased for the price of $149.99. True to its name, the Exerpeutic 100XL “high capacity” manual treadmill is capable of shouldering a significant amount of weight compared to other options on the market. The treadmill was demonstrated to be capable handling up to 325 pounds of user weight. For a more seamless and uninterrupted pace during the workout, the treadmill was designed with two flywheels (six inches in diameter). The treadmill can assist users who want to track their heart rate with built-in heart pads that they can use at their convenience at any point in time during their session. To accommodate the stride of taller users, the Exerpeutic 100XL was designed to be slightly longer and wider than other manual treadmills on the market. The width and length of this manual treadmill are considered by some to provide benefits on par with an average electric treadmill. As an added safety measure, the treadmill has two extra-long safety handles that were built into the frame. The Exerpeutic 100XL’s safety handles are roughly twice as long as the safety handle length typically found on other treadmill models, providing extra security and balance on while walking or running. The stabilization of the treadmill’s belt speed is enhanced with a magnetic tension pacer mechanism. The treadmill’s default incline begins at 8% and is capable of being adjusted to 10% and 15% at the owner’s leisure. Some users find that the initial 8% incline helps them spare stress on their ankles that can’t be avoided on other manual treadmills that start with a higher incline. An LCD display is in place so that the user can easily view their time, the distance they’ve walked, the calories they’ve burned, their pulse, and their level of speed as well. If the user wants, they can store a television remote control on the console while they’re exercising. Due to the length of the treadmill, users who are as tall as 6’ can comfortably stride on treadmill without feeling as though they’re constantly running out of room. The walking belt is approximately 10 inches above the ground, so in a room that is 7.5ft tall, or 90 inches, a user who is 6’5” tall (78” and 10” above the floor for 88”) will still have 2 inches of space above their head. Users have testified that the treadmill is reliable once completely operational, though some have stated that the treadmill did take a slight bit of tinkering before it was completely ready to go. One owner testified that they had to move the magnets away from the flywheel with a small metric wrench and that there could be slightly more tension at 12% incline, but for the value, it was passable. The standard dimensions of the treadmill are 50 x 29 x 50 inches, and when folded, the dimensions are 35 x 29 x 61 inches. The treadmill’s belt size is 45 x 16 inches, and the treadmill itself weighs 81 pounds. The treadmill can be purchased for the price of $219.00. The Phoenix 98510 manual treadmill is made with a heavy-duty weighted flywheel. Thanks to the weighted flywheel, users can run on the treadmill without bumpiness. With single-button electronics, users can accurately track their time, calorie expenditure, distance and average speed. The treadmill’s frame can be folded and locked into an upright position that makes it easy to conveniently store, and it also has a compartment that the owner can use to store their water bottle. Users who only have a limited amount of space to place their treadmill in might find the spring-loaded pin to be highly convenient. The spring-loaded pin is what allows users to freely fold the treadmill and lock it in place for easier storage and transportation. Users have testified that the treadmill is relatively easy to construct upon receiving and unboxing. Some users have chosen to create a level platform to create a steadier surface for running, but even with a steadied platform, it’s highly recommended that users hold onto the handlebars at all times. One user testified that the treadmill was a welcome alternative to the expensive electric treadmills that they had been considering beforehand. After receiving the order, they were able to put it together in only an hour. The customer testified that the experience of using the manual treadmill’s incline surface was a much more demanding workout than what they had experienced on a level treadmill surface. The user was pleased by how light and easily movable the treadmill was, allowing them to move it into different rooms between workouts and easily position it at the optimal angles for watching TV or looking out of the window during their exercises. The user was also pleased by the fact that the treadmill took up much less floor space than the average electric treadmill. Due to the rubber and metal surface area, the user found that the treadmill was slightly less oppressive to their joints than running on asphalt or concrete. Thanks to the LCD display, the user didn’t have to constantly keep checking their odometer in order to see how far they had run over the course of their session. One challenge that the user ran into was when they found that a few key screws were missing after they had begun putting the treadmill together. The user called the manufacturer, and they were satisfied to find that they could communicate with a person who swiftly addressed their needs. They were mailed replacement screws that arrived within just three days of making the call. After a few weeks of use, the customer noted that their treadmill’s pre-lubrication was beginning to slightly wear off; they were able to promptly fix this issue by lifting the belt slightly higher and administering light sprays of WD-40 in the affected areas. The treadmill’s dimensions are 46.5 x 50 x 21.1 inches, and the weight is 50.6 pounds. The treadmill’s belt measurements are 41 by 13 inches. The treadmill can be purchased for the price of $131.11. The Stamina InMotion manual treadmill is made with a durable steel body and two weighted flywheels. The treadmill has two different incline positions, at 8 degrees and 10 degrees. With an electronic monitor, users can accurately keep track of their calorie burn, average speed, and the time and distance that they’ve spent running. To make it safer for the user to walk and/or jog without suddenly slipping, the tread belt has been textured and the rails have been padded with foam. Prospective customers are advised that they might need to manually adjust the belt’s tension before it can be used smoothly after assembly. The belt itself has been factory adjusted, but if the user desires, they may personally adjust the belt relatively easily. Belt adjustment instructions for the treadmill are included in the included assembly manual. The bars and handles can potentially be removed from the treadmill’s main belt, but owners may not want to be too hasty about removing them; the side bars are what keep the main body of the treadmill constantly supported off the ground. Owners who are interested in adjusting the treadmill so that there isn’t any incline will still need to hold onto the side rails in order to maintain their balance while in action. This treadmill, unlike a number of other manual options, can’t be stored under the bed after it’s been folded up. When folded, the treadmill is meant to remain standing. While the treadmill can’t be kept in a small storage space while folded, it still won’t take up very much space in whatever area that the user keeps it. The general reception to the treadmill has been relatively positive. One reviewer testified that they found the treadmill very well-packaged upon delivery, and to their pleasant surprise, they were able to fully assemble it in just ten minutes. The user stated that they had used graphite powder to lubricate the plate that the belt rode on, helping it run just a bit more smoothly. As a preventative measure against slippage, the user made a point not to put any lubricant on the rollers. The user themselves was 225lbs, and they found the overall sturdiness of the treadmill to be highly reliable for its size and length. While the first few steps that the user took were a bit jerky, they reported that the belt ran smoothly after just a few seconds. The user stated that they believe the treadmill’s belt can become even more ergonomic with consistent use, so prospective buyers may want allow some time for the machine to adjust to their weight and stride before it becomes a perfect fit. The treadmill’s overall weight capacity is approximately 225 pounds. When fully assembled, its dimensions are 47 x 22 x 45 inches, and it has a 17 by 22-inch footprint when folded. The full weight of the treadmill is approximately 50 pounds, making it easy for most users to move from room to room without much strain. The treadmill can be purchased for a price of $117.99. The length of the deck will directly interact with the wideness of your stride. Before spending money on a treadmill, it may be a good move to get a rough estimate on the length of your stride while running. Once you have the length of your stride figured out, match it up to the length of the deck so that you have a perfectly ergonomic fit. Every manual treadmill operates on the same basic kinetic principles, but there are different types of treadmills uniquely made for different functionality. Folding treadmills tend to be slightly sturdier, but at the same time, the deck might be a bit shorter than what some users are comfortable with. Non-folding treadmills are popular with the more frequent runners and slightly heavier, but at the same time, they tend to have less settings. Different features and designs will result in different prices, so be sure to take these things into account to get the best value for your dollar. It’s easy to overlook the size of a treadmill before trying it out, but it’s an important thing to consider if you want to make the best choice. The average footprint size of treadmill is around 75 by 35 inches, though this can vary depending on the type of treadmill it is. Before buying the treadmill, it may be wise to take measurements of the free space you have in the room you’re considering putting the treadmill in. The extent of how swiftly and heavily you can run on a treadmill is one of the most important factors to consider before committing to the purchase. In general, most treadmills can support about 250 pounds and will allow you to reach a top speed of around 11 mph while remaining functional, though there are always exceptions to the rule. Knowing the top speed in advance will not only assist in the convenience of making a fitness plan, but also serve as a safety measure by mentally preparing you for the treadmill’s power. In addition to the basic accommodations, different treadmills may also offer different auxiliary features for your convenience. Certain treadmills may have a USB dock that you can use to plug in your iPod while you’re running. Treadmills may also feature a built-in Wi-Fi hotspot for your mobile device or various applications. Certain users may or may not have unique running programs that fit the nature of their personal fitness goals. In certain cases, a treadmill’s mechanics will offer you the opportunity to establish a running course with fluctuating intensity. Whether the realization of your goals requires high intense interval training (HIIT) or steady endurance-based training, be sure to confirm that the treadmill you’re considering has the mechanics to fit the bill. The treadmill can be a wonderful resource for getting in a high-quality cardio workout on any day of the year, but there are subtle factors in the experience of using a treadmill than many people might overlook. Be sure to pay close attention to the ergonomics and size of treadmill before committing to buying it. Take measurements of the free space in your fitness room and the length of your own stride. If you make a perfect choice for a treadmill to buy, it should be a purchase that you only need to make once.